With more than 80 patterns and tutorials available there's now 3 ways to find them. One is by visiting my picasa web albums as given below in 2 slideshows OR scroll down past the slideshows and I explain how to find them right here on my blog. OR use the search bar on the right side of this page. The first slideshow is all my tutorials dating from 2014-2013 starting with the newest posts going to the last of 2013. Clicking on the photos will bring you to my picasa photo album away from this blog but each one has a link to that pattern under the photo on picasa that will bring you back here. The second slideshow is all my tutorials dating back from 2012-2011. Starting with the newest first. Scroll a bit further until you see the label list just as pictured below, (it's on the right hand side too). A label list brings up all the patterns with that particular label in it.. for example if you click on monkey then all the posts with the word monkey in it will come up for you. The number inside the ( ) tells you how many posts or patterns will come up. Hi Sharon! I have a huge request! I noticed you have a pattern for the Big comfy Couch dust bunnies and was wondering if there is any possible way you could make a pattern for Molly and Lunette? They were my daughters favorite when she was younger and I would love to make them for her. I'll will be willing to buy the pattern. Only if you can because I know its a huge request. Sharon, can you make a little bigfoot cow? My youngest granddaughter has taken a liking to cows and I love the Little Bigfoot patterns! I made monkeys and bunnies for her two sisters. Thank you so much for your consideration! I am looking for a DOLPHIN pattern. the only 1's i can find are 12" or more long. On the fox ears it says (12) which is right...then it says to do 1sc then 2sc in next st (15) and no matter how i did it I could not come up with 15 the way it says it comes to 18...am I doing something wrong? Were do I find the pattern for the Easter egg bunnies? 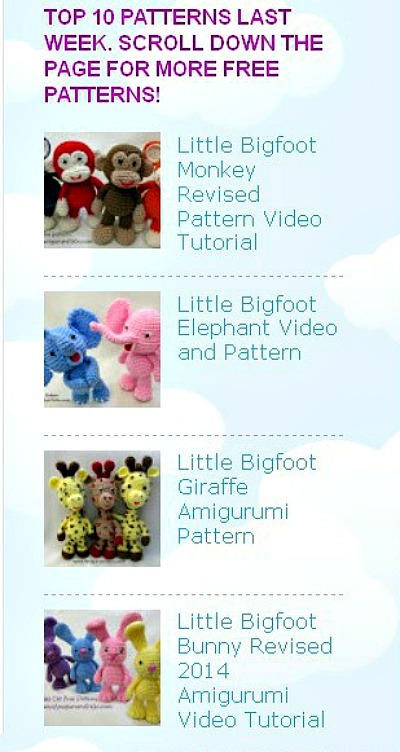 Thank you so much for your little big foot monkey pattern and tutorial. I have tried amigurumi in the past with limited success but you have made it so easy. Your tutorial is the best I have ever seen. Thanks again.